> Bring pineapple, orange juice, chipotles and cumin to a boil in a medium size sauce pan over medium-high heat. > Reduce to low heat and simmer, stirring frequently until sauce is thickened and reduced by half. (Approximately 1 hour). > Remove from heat and stir in lime juice and cilantro. > Season ribs with salt and pepper. > Rub ribs with coriander seeds. > Grill ribs over medium heat 3-4 minutes per side. 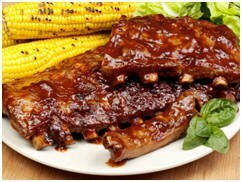 > During the last minute of cooking, brush ribs with BBQ Sauce. > Serve ribs with BBQ Sauce on the Side.